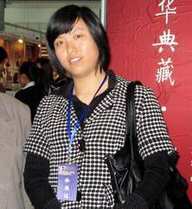 Weifang Pu, a silk embroidery artist and a senior member of Suzhou Arts and Crafts Association, was born in 1978. She is young but she has been doing embroidery for more than 20 years. She learned to do embroidery from her mother at the age of 7. When she was 16 years old, she was no longer satisfied with the skills and techniques she learned from her mother though her skills were much better already than her peers. She was admitted into the Suzhou Embroidery Institute in 1996, a government owned organization then that gathered the most skilled embroidery artists in Suzhou and even in China. 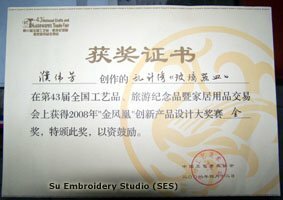 She studied and worked there for 6 years and improved her embroidery skills greatly. 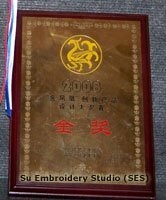 In 2006 she started to work with Su Embroidery Studio (SES) and became the embroidery art director and quality supervisor there.